Me and one of my teacher friends, Jessica. Why does this always happen? Why, at the very end, do things always start falling into place and being so perfect? It’s like the goodbye is laughing at you and trying to make things as hard as possible. My last couple of weeks, and especially my last few days, have been the best ones. It’s not like things weren’t good before, but I finally had that feeling of belonging. I felt comfortable in the city and less like a caged animal. 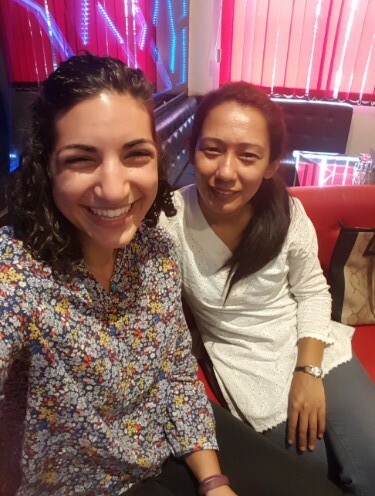 I had friends who were funny and goofy and reminded me of my friends back home. I went places and did things and hung out with the aforementioned friends. It was like I was just another person, woven into the fabric of the city, rather than an outsider. It took almost my entire time there, but I finally felt fully at home. 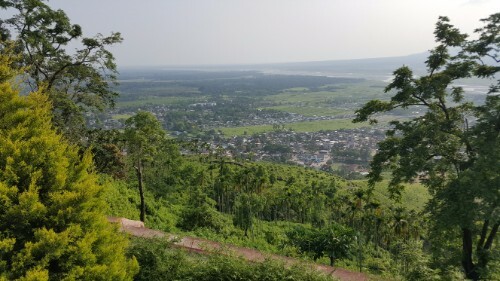 The view of Jaigaon from monastery #2. 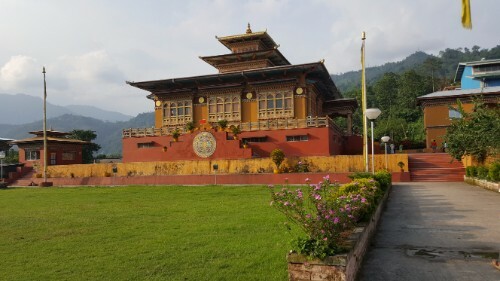 One of the royal residences in Bhutan. Apparently they used to come here often during the winter because it gets so cold in the capital. So that’s what we did! In three days, I did more travelling around Jaigaon than I did in 7 weeks. 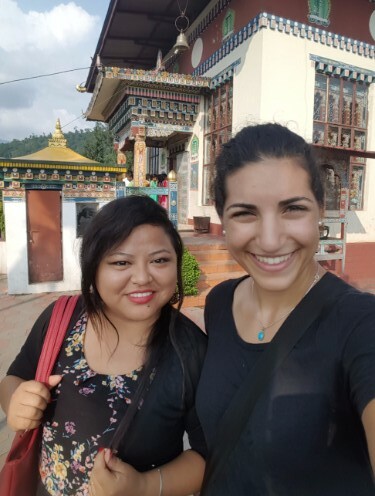 We went to Bhutan and visited a bunch of different monasteries, I tried some foods and drinks that I couldn’t even begin to name if I tried, I hailed and rode an auto on my own, and I finally started feeling like I was a real person. One of my completed plans! I also made a mad dash to wrap up the architecture drawings for the Bible school, and I finished on Monday morning, my last day, at noon. Pretty good, I think. I didn’t even have to stay up late to get everything done. Packing was also surprisingly easy. If there’s one thing I’ve learned how to do quite well over these last 10 months, it’s how to pack a bag. If there are two things, the second would be how to say goodbye. Buddhist prayer flags. They have prayers written on them, and when they blow in the wind, that’s supposed to be the same as someone saying the prayer. By the time I went to sleep Monday night, everything was ready. I don’t think I’ve ever been ready so far ahead of time. It helped that we had to leave at 7AM Tuesday morning. The only thing I hate more than packing is waking up early. Now here I am, sitting in another airport (we have to stop meeting like this). Just wait until I tell you about my travel schedule to get home… I would do it now, but you’ll understand when you see it. It needs its own post. I LOVE the painting on all of these buildings. My teaching responsibilities here are officially finished! I won’t pretend that I’m terribly upset about that, but I am sad that my time here is coming to an end. I’ve made some great friends, and it will be hard to say goodbye to them. The last days of extra classes with the class 9 kids were good. We made it through two dramas in their book, and I think that the kids understood the main ideas of both. With our foolproof story-teaching formula, how could they not understand? As long as you explain the story 5ish times, you’re set. I’m glad that Jenrika and I are on the same page about the kids needing to be able to think for themselves. We’ve both been trying to work on that, and it makes me feel like everything I tried to teach them over the last couple months isn’t going to go completely to waste after I leave. I feel bad that she’s going to have to continue the efforts alone, but hopefully we’ve laid some sort of foundation… maybe? 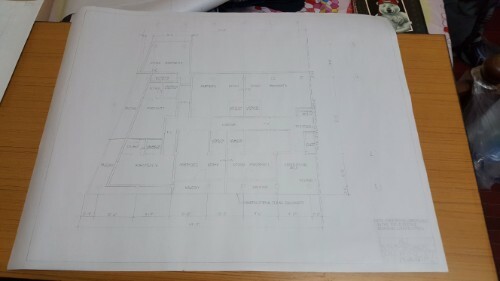 My afternoons have been spent working on the architecture plans for the addition at the Bible school. Okay, not all of the afternoons. I’ve also spent some time reading and swinging on the roof, but now I’m running out of time, and I really need to get those plans done. It takes SO long though. I don’t have the computer programs that are usually used to make plans, so I’m drawing them by hand. As if that didn’t already take forever, I also don’t have all of the tools that you would normally use for hand drafting. I have a pencil with those points that you take out and stick in the back of the pencil when they go dull, an eraser, and a ruler. That’s all. 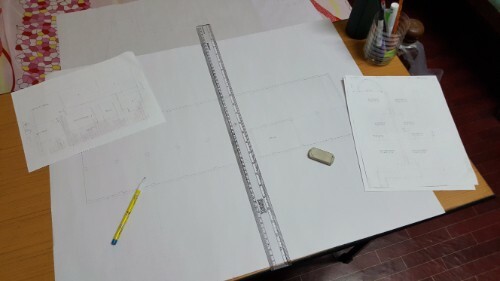 Fully equipped, I would have a drafting table with a slide rule, a ruler, multiple pencils of various hardness, a sharpener, a triangle, shape stencils, an architecture scale, and a thin eraser. At the very least. Since I don’t have all of those things, it’s taking me much longer than it otherwise would, and my drawings are definitely not going to be as precise as they should be. I am enjoying working on them though. I have everything mostly figured out, so now all I have to do is draw lines… well, and covert dimensions so that the drawing is to scale, but that only requires a little thought. Even with that, it’s a relaxing task, and it will fun to see the finished product… assuming I ever manage to finish. Today, however, was an exception! To celebrate our last day of extra classes, I went to lunch with Jenrika, the other teacher who’s been teaching this week, and two other teachers from school. It was so much fun! 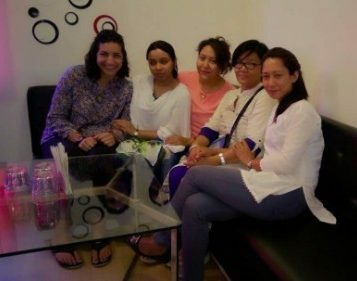 I really did feel like a normal person, and even though they didn’t speak in English all the time, they at least TRIED to. If a conversation went on for too long in Nepali, someone translated to clue me in. It was really nice. We were going to go for a walk after lunch, but the wind started blowing dust around (I’m telling you, the dust is one of the worst things about being here… If you were here, you’d understand why people sometimes wear face masks. Breathing that stuff in is not good) and it looked like it was going to rain. We went back to Jenrika’s house instead and just hung out. I felt like I was back home hanging out with a bunch of my friends. It kind of stinks… I finally feel like things are really coming together for me here, and I’m leaving in a couple of days. Well, all I can do is enjoy the time I have left and celebrate the fact that I achieved my goals of making real friends and feeling like I belong. We also played dress up, and who doesn’t love that? 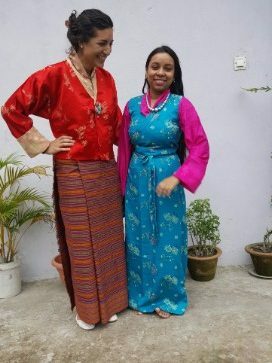 Jenrika is from Bhutan, so she has a bunch of traditional Bhutanese clothes. They dressed me up in a kira… and when I say, “they dressed me up”, I literally mean that I was like a doll. I don’t know how anyone dresses themselves in these outfits. First, I put on the wonju, a long-sleeve, sheer blouse (long sleeve like it went about a foot past my fingertips). Next was the kira. It’s just a big, rectangular piece of fabric that you wrap around you. They put a “half-kira” on me which means that it only went up to my waist instead of all the way to my shoulders. The toego goes on top of that. It’s like a jacket with sleeves that go about to your fingertips. The sleeves of the wonju and the toego are folded up together, the toego is secured with a brooch, your hair goes up in a bun, and you obviously also need to add a necklace. Getting ready for my modeling career. Bhutan and Tibet… and the USA and India… So many countries represented in one picture! By the time they were done with me, I felt like a queen. I also felt like I was going to melt into a puddle because the kira was like a blanket and the toego was NOT lightweight. 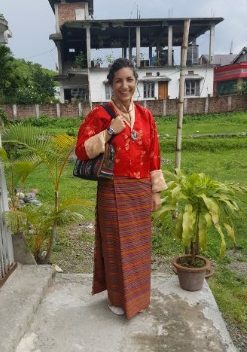 Jenrika also had a traditional Tibetan dress, so one of the other teachers put that on and it was like an international clothing party. It’s really cool visiting these places where the culture and traditions are so strong and SO different from home. What would the traditional dress of the United States be? Jorts (jean shorts, for those of you not down with the lingo) and t-shirt? Look at how clean this street is! AND there’s a sidewalk!! Jenrika and I met up earlier this week to get ready for the extra classes we have to teach, and I learned something VERY exciting. I’m sure I’ve mentioned before that Jaigaon is right on the border of India and Bhutan. It’s very easy for Bhutanese and Indian people to cross between the two countries. 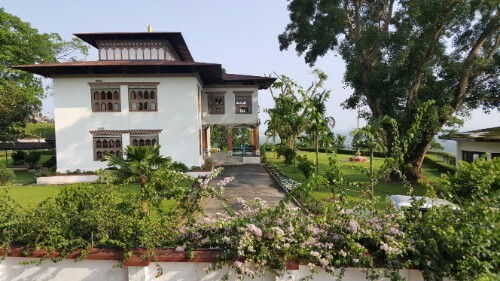 It’s complicated and expensive for most other people to get into Bhutan because they’re trying to minimize Western influences in the country (“high value, low volume” tourism… people have high-quality experiences, but it’s expensive so the country isn’t overrun). 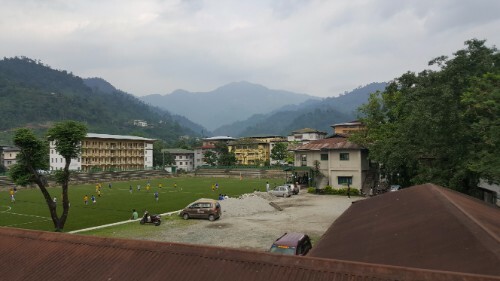 I had pretty much accepted the fact that even though I’m right here and can see Bhutan from my window, I would never get the chance to cross the border. Here’s the exciting part… I met Jenrika at the Bhutan Gate, and she started walking like we were going to go into Bhutan. I said that I didn’t think I was allowed. She said she thought I was. 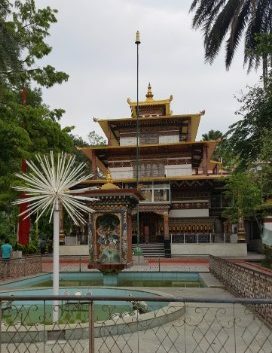 Sure enough, she asked the guard, and anyone is allowed to go into Phuentsholing, the city on the border!! 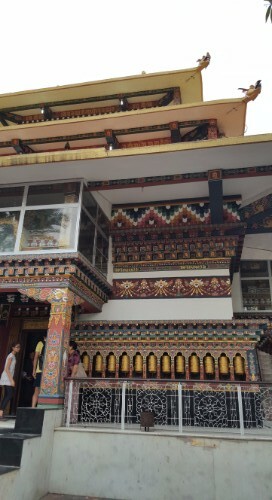 They check your documentation if you try to go farther into the country, but no matter… I went to Bhutan!!! Bhutan is an interesting country. It’s very small, recently (2008) changed from being an absolute monarchy to a constitutional monarchy, and Mahayana Buddhism is the country’s official religion (it’s around 75% Buddhist and the rest Hindu). India gives them a lot of money and military support because as it was explained to me “if India doesn’t, China will”. 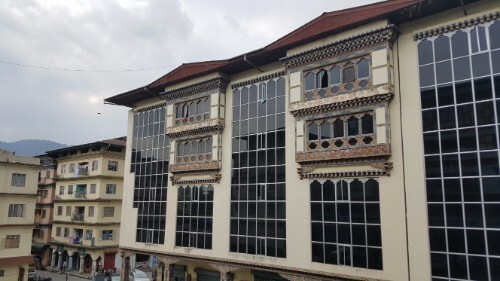 India and Bhutan have had special treaties for years because Bhutan is like the buffer zone between India and China, and India doesn’t want the Chinese army camping out right on its border. The main export is hydroelectric power, and much of the money for that development has come from India. The rest of the economy is built mostly on tourism and agriculture. Most of the country covered in forests, and the government has made a strong commitment to preserving and protecting the environment. There’s a big push for electrical cars, and between the hydroelectric power and forest cover, the country is carbon neutral. The government has committed to keeping 40% of the country’s area as national parks and protected areas and 60% covered by forests. That’s pretty awesome! It is considered a very happy country and attempts to measure its “Gross National Happiness” level. 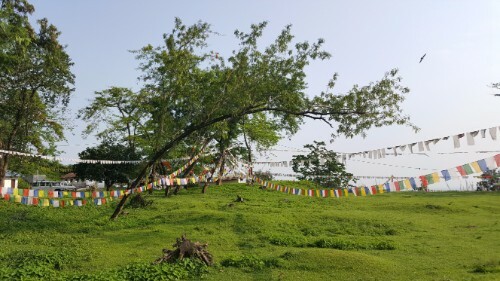 The pursuit of gross national happiness is even included in its 2008 constitution. The caveat to this is that happiness is hard to measure because it’s subjective, and just because people say they’re happy doesn’t mean that there’s no more work to be done. Many people are financially poor (about 30% live below the poverty line), and about 70% don’t have access to electricity. It’s interesting walking from India into Bhutan because there are some differences that are immediately clear. The biggest one – trash. 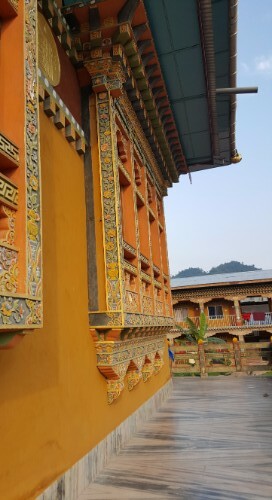 Bhutan is impeccably clean. There are trash cans everywhere. In India, the street, forest, river, etc. is your trash can. The second biggest one – rule following. 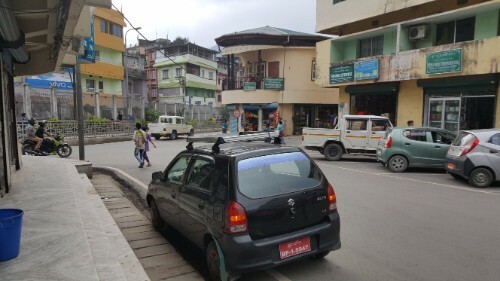 In Bhutan, people use crosswalks. They wear helmets on their motorcycles and don’t put 15 people on one. No one is sitting on the roof of the buses in Bhutan. In India, especially outside of the big cities, don’t expect any of those things to be true. When I saw a park and no trash on the ground, I almost cried. I wish I knew about the whole entry situation earlier because I would have been taking weekly mental health trips across the border! We went to a café, I drank strawberry lemonade and ate a chocolate lava cake, and we threw some plans together for classes this week. It was like being in a wonderful alternate reality. So many buildings have painted details that make it obvious that you’re in a different country. 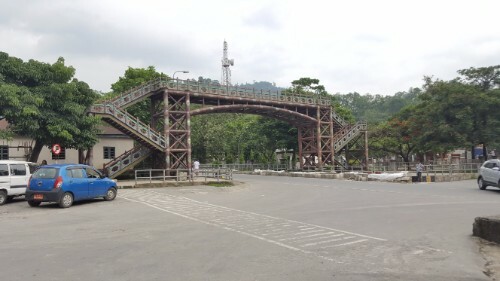 Even this pedestrian bridge is painted! A soccer field! That is made of grass instead of dirt, trash, and poop! And those mountains don’t hurt either.